Australia has created history by winning the first Olympic gold medal awarded in women's rugby sevens following a thrilling 24-17 victory over New Zealand at the Rio Games. A four-tries-to-three effort against its trans-Tasman rivals set up Australia's triumph at the Deodoro Stadium, a historic moment in the debut of rugby sevens at the Olympics. Emma Tonegato, Evania Pelite, Ellia Green and Charlotte Caslick scored tries for Australia, while Chloe Dalton managed two conversions. Tuesday's success (AEST) added to Australia's maiden world series victory earlier this year. The win vindicates the investment the Australian Rugby Union has made in women's sevens since the 2012 Olympics in preparation for the sport's maiden Games appearance in Rio. Several of the squad had never picked up a rugby union ball until joining the program. New Zealand coach Sean Horan stirred the pot before the final when he claimed Australia was suspect to defensive physicality and aggression when it had ball in hand. It appeared his pre-match barb may have rattled the Australians in the second minute, after a knock-on just outside their 22 immediately put them under pressure, giving New Zealand a scrum field and vital field position. The New Zealanders were awarded a breakdown penalty soon after and marched well inside the Australian "red zone" but were denied a try when a desperate Shannon Parry cover tackle put Huriana Manuel into touch on the right flank. 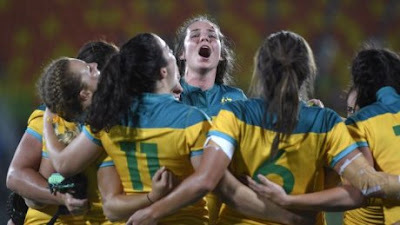 Australia did not help its cause, however, when a crooked line-out throw five metres from its goal line handed back possession to New Zealand, who did not waste the chance and scored the opening try in the left corner through Kayla McAlister. The early physicality of New Zealand's defence had kept Australia pinned in its own half when it had the ball, but eventually it gained territory to set up Tonegato with a run for the line. Tonegato was mowed down by the New Zealand cover defence 10 metres from the opposition goal line but the former Australia rugby league representative got across the stripe moments later for a five-pointer. New Zealand let itself down on the stroke of half-time when star back Portia Woodman was handed a yellow card and Australia capitalised on the numerical advantage to score its second try in the left corner through Pelite to establish a 10-5 lead at the break. Australia looked the more confident of the two outfits that emerged from half-time and it struck again following a scintillating attacking movement that resulted in Green scoring. Dalton added the conversion to set up a 17-5 advantage and the Australians put the win out of New Zealand's reach when it posted its fourth try with five minutes to play. Breakdown pressure from Australia saw New Zealand give away a penalty inside its 22, allowing Caslick to scoot over to put her side further in front. New Zealand managed two late consolation tries, with McAlister adding her second and Woodman scoring on full-time. Earlier, Canada secured the bronze medal with a 33-10 win over Great Britain the play-off for third.